Discussion in 'JKT48 Graduated Members' started by CherryBlossom48, Sep 14, 2016. Gaby said she’s a bit clumsy herself but it turns out Citra who is the relatively new jkt kohai is super clumsy and Gaby seem lose her clumsiness when facing the already inferior Citra. Citra starts with frightened as hell but managed on stage until the end with her antics made this eps stands alone as genuinely very funny in its way. Citra = image in Sanskrit. “Citra” also familiar with Indonesian women. Good luck with the new path! "I love JKT48 esp. 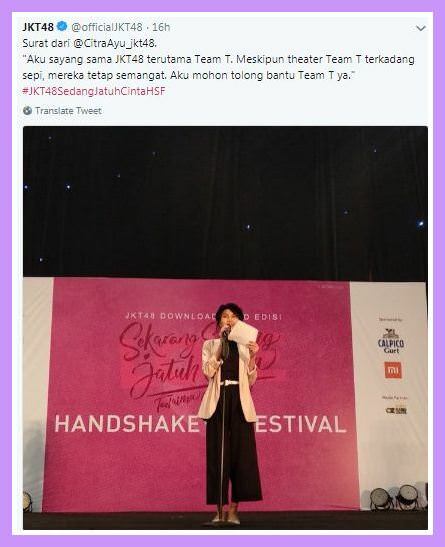 team T. Even though team T's theater sometimes quiet [less attendants] they always remain spirit. Please always support team T". Some of Citra's recent images taken from her IG. Looks fresh and fashionable. Citra's type is simlar with Gre [Shania Gracia]. Also in local celeb there's Fenita Arie, a tv infotainment host. Fenita with her inner beauty's now got a happy family. Citra will take part in Nawangsih movie, written by Melly Goeslaw (one of the best songwriter in Indonesia) along with big names such as Mario Lawalata. I think it'll premier on Tribe streaming service.